Circular coin weight for weighing a Spanish 8 Reales. Obverse: Coat of arms of Castile-Léon in multilobe, PHILIPVS IIII D:G HISPA REX around. 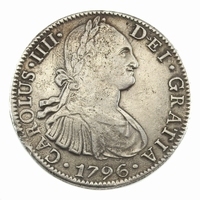 Reverse: Crown above with XXI DE VIII GR and 8 R below. 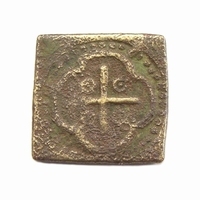 Weight: 27 g; Ø 27,99 mm.